At the beginning of each year, prognosticators and crystal ball enthusiasts practice the craft of forecasting coming trends in everything from the coming year’s sports champions to the price of all things necessary or extravagant. The field of marketing has its own bevy of practitioners providing perceived trends for the coming year. Regardless of the direction taken to connect best with customers in 2018, the journey will be marked by continued advances in technology and shifting consumer acceptance and utilization of that technology. Newspapers, magazines and other written media channels will continue to see significant erosion in influencing consumers in 2018. With the rapid advancement and consumer acceptance of digital communication technologies, hard copy collateral’s decline appears to be in a free-fall that will be difficult or improbable to stem. The forecast for 2018 predicts another 6.8 percent decline for the embattled industry segment. However, the traditional print media are not the only marketing purveyors predicted to suffer set-back in the coming year. As other social media outlets continue to experience growth in user base, Twitter was unable to advance the ball in 2017. Twitter sought to increase its number of users by increasing the popular 140-character limit to 280. It didn’t prove to be the key to differentiate itself among other social media leaders. Marketers are already using other social media platforms to connect with prospects in more than 140 characters. It is a trend of decline for Twitter that some predict will continue in 2018. With more platforms incorporating big data capabilities within platform infrastructure, marketers will tap into the myriad of consumer data points in order to remain competitive. In addition, consumers are expected to continue embracing interfaces that require little or no physical inputs, such as the smart speaker. People are interacting with these devices as part of their daily lives, using voice commands and listening to the results. Thus, there is a substantial opportunity for marketers to communicate with them in a different way. – Influencer Marketing. Influencer marketing is expected to remain a useful strategy. With nearly 95 percent of marketers touting it a successful strategy in 2017, brands are expected to continue utilizing influencers to connect with their customers through social media. – Apps. The future of apps remains bright. A prediction for 2018 suggests strong growth in app utilization and capitalization. – Live Events. Nearly 66 percent of marketers say that they will increase their participation in hosting live events in 2018. Live event hosting remains a reliable and highly effective marketing channel. – Augmented Reality. Ground gains are anticipated in the utilization of augmented-reality (AR) content. As new devices like iPhone 8 and iPhone X populate and go mainstream, brands will begin to increase their exposure through AR-branded content. – In-Car Advertising. As driverless cars begin to arrive on the roads of America in greater numbers, in-car advertising may be the new frontier in advertising. How are your strategies stacking up in the New Year!? Any fan of high school, college or professional football is well-aware of the concern many players, coaches and owners have about the rate of head and brain injuries suffered by players across all levels of the sport. Head injuries and concussions caused by contact sports are a growing epidemic, particularly among young athletes. If left unprotected, concussions can result in long-term brain damage and may even be fatal. The Center for Disease Control (CDC) reports that concussions have doubled in the last 10 years and The American Academy of Pediatrics has revealed a two-fold increase of emergency room visits for concussions in kid’s ages 8 to 13 years old. Concussions have also risen 200 percent among teens ages 14 to 19 in the last decade. As school athletic programs and league rules committees scramble for ways to mitigate these injuries, one innovative early stage company, Hobart Mayfield, is applying science to finding a better way for players to avoid serious head injuries. 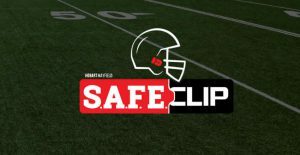 Their innovative solution is S. A. F. E. Clip, an energy absorbing connector located at connection points where the facemask attaches to the helmet. By absorbing forces of a direct impact on the face mask, S.A.F.E. Clip demonstrated a reduction in force of 24% and 28% for translational acceleration and rotational acceleration, respectively compared to the standard face mask clips. Junction Creative Solutions (Junction) recently partnered with Hobart Mayfield to design and develop a new website to showcase the S.A.F.E. Clip and its many benefits to athletes of all ages. For more information on Hobary Mayfield, visit www.hobartmayfield.com.